Whenever you see a person in a uniform, you get a quick sense of who they are and what they do. The members of a sports team wear their uniforms to say "I belong to this group." Police officers and firefighters wear their uniforms to say "I provide a service to my community." Even superheroes wear uniforms to say "I'm one of the good guys, and I stand for what's right." Just like all of these people, Scouts also wear a uniform, and for the very same reasons. As a Cub Scout, you belong to a special group of people, you give service to your community, and you have made a promise to do your best to be one of the "good guys." Wearing your uniform is a way of saying these things to everyone who sees you. Because Webelos Scouts are close to becoming Boy Scouts, some Webelos dens choose to wear the tan and olive uniform similar to the one that Boy Scouts wear (tan shirt, olive shorts/slacks, olive socks). Besides showing that you are a member of the Cub Scouts, your uniform gives you a place to display your personal achievements and those of your den and pack. Badges of rank, award emblems, special recognitions, and the medals you win at Cub Scout activities are all sewn or pinned onto your uniform. 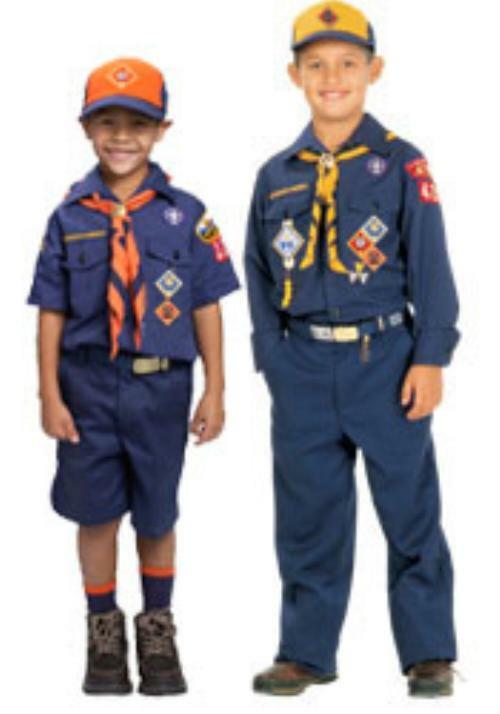 Unless your den leader says otherwise, you should wear your Cub Scout uniform to all Scouting activities—not only den and pack meetings, but every activity in which you take part with other Cub Scouts.